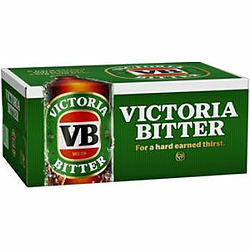 Australia'a favourite full strength beer, Victoria Bitter or VB as it's fondly known, has a tradition of rewarding hard work and hard play, dating back to the 1890's. VB is a full flavoured brew, less malty in character and slightly darker than Cub's traditional lagers. A gentle fruitiness in the aroma compliments the sweet malt on the mid-palate balancing perfectly with a robust, hop bitterness.